BBC News reports that there has been a dramatic increase in the number of crop circles in and round England. Some believe these crop circles contain imagery from the Mayan civilization and could be interpreted as communication from a civilization 1,000 years ago by ‘mysterious forces’. The formation, thought to be as long as a football pitch, appeared in a field near Silbury Hill over two nights at the beginning of August. Some say the pattern is made by mysterious forces and features symbols from the ancient Mayan civilisation which mark the beginning of a new world order. Others believe it is made by commercially-minded ‘landscape artists’. The only ‘new order’, these sceptics say, will be from publishers wanting photographs of the design. So who is right? Is it possible that someone or thing is trying to communicate with us using imagery from a culture more than 1,000 years old. Or is this just the latest example of landscape art that will be displayed on the pages of books and glossy magazines? Francine Blake, a crop circle expert from Wiltshire, believes the crop formation indicates the world is going to change dramatically. “The Moon has a cycle around the Earth, the Earth has a cycle around the Sun, the Solar System has a cycle in the Milky Way,” Ms Blake says. “That [the galaxy cycle] takes 26,000 years, and this particular calendar is coming to the end of that cycle. Ms Blake likens the changes ahead to that of the fall of some of the great empires. “Just like the era for the Romans stopped and something else started, we are going from era to era and this is the end of one of them,” she said. Art or a mysterious forces? It seems after two decades of ever more sophisticated designs, the crop circle community remains divided over this rural ‘phenomenon’. But throughout the debate, there is one point on which everyone agrees: these elaborate patterns can be a dramatic and fascinating addition to the natural landscape. Everyone, that is, except the farmers whose crops are crushed to make the circles. Seems as if this post is the most active… anyone have any thoughts about it? I think its God making these crop circles…. to be the universal form of communication and a display of ultimate balance. Its also supposed to be the key to all lifeforms. It resembles DNA and is infinite in design. 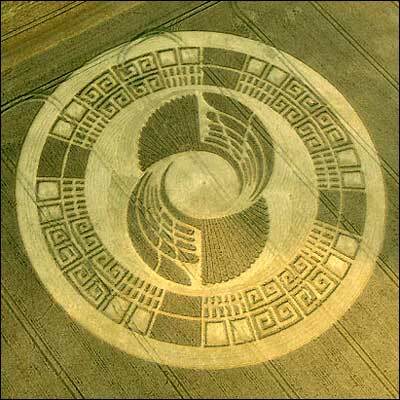 Its amazing that pics of sacred geometry look exactly like crop circles. The size, volume and accuracy cannot be man made. Especially in the course of a night or two. I believe someone, not of this world, is trying to tell us something.